Astrophotography can be challenging. After all, you are not simply shooting something right in front of you, but an object that may be located millions of miles away and invisible to the naked eye. But you only have to look at a beautiful picture of a star trail against the night sky or even the full moon to understand why astronomers and photographers alike are drawn to astrophotography. People have been taking pictures of the night sky since the early days of photography. In fact, John William Draper captured the first image of the moon in 1840. Ten years later, William Cranch Bond, the director of Harvard College Observatory, and J. A. Whipple, a photographer associated with Massachusetts General Hospital, took the first photograph of a star. Because capturing faint images using long exposures can be challenging amateur astronomers were often on at the forefront of technological advances in photography. New silver bromide dry emulsion plates allowed scientists to capture the first planetary images and study the spectra of stars in the late 19th century. It also facilitated the first wide-scale surveys of the night sky. In the 1970s, the invention of the CCD (charged coupled device) camera revolutionized the field of astronomy and largely replaced the use of standard film. Today, cameras and telescopes alike rely on digital processing and other technology to reach further into space and capture amazing images. The Hubble Space Telescope, which operates outside of the earth’s atmosphere, can record stars down to the 30th magnitude. For amateurs, astrophotography can be as simple or as complex as you would like it to be. Many beautiful images can be captured with a standard digital camera once you learn some basic methods and buy some simple equipment, like a tripod. 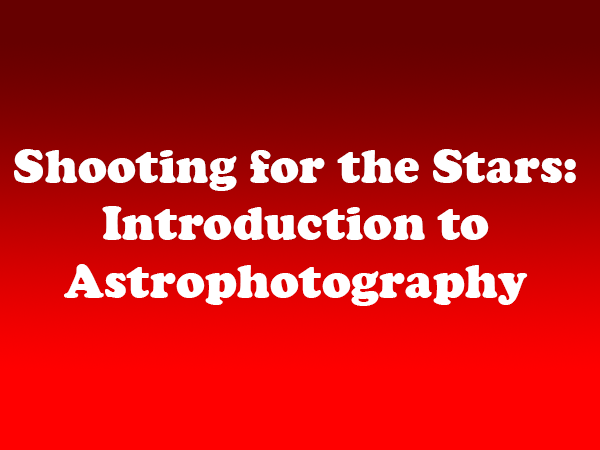 A crash course in astronomy is also helpful to identify and track what you are shooting. There are a number of great resources available online, such as skyandtelescope.com. For those with the time and financial resources to devote to astrophotography, the possibilities are endless, from incorporating telescopes to sophisticated image processing software to buying camera equipment specifically designed for capturing the night sky. Thanks to technology, astrophotographers can shoot father than ever before. For more tips and resources, please check back for additional posts in this series.